Acrylic sheet front and side doors (full visible Transparent) 3' germicidal ultraviolet tube and 2' fluorescent tube for white light with necessary choke blast, starter and switches fitted. Also main lead and plug provided. Two holes with rings and sieves for insertion of arms provided. - Do fitted with small tube. 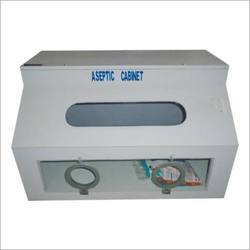 Aseptic cabinet :-size 95x50x50 cms with sloping front. Acrylic sheet front and side doors (full visible transparent) 3' germicidal ultraviolet tube and 2' fluorescent tube for white light with necessary choke blast, starter and switches fitted. Also main lead and plug provided. Two holes with rings and sieves for insertion of arms provided. 1. Do- fitted with small tube. Size 95x50x50 cms with sloping front. Acrylic sheet front and side doors (full visible Transparent) 3' germicidal ultraviolet tube and 2' fluorescent tube for white light with necessary choke blast, starter and switches fitted. Also main lead and plug provided. Two holes with rings and sieves for insertion of arms provided. b) -do- fitted with small tube. Size : 95x50x50 cms with sloping front. - Size 95x50x50 cms with sloping front. - Acrylic sheet front and side doors (full visible Transparent) 3' germicidal ultraviolet tube and 2' fluorescent tube for white light with necessary choke blast, starter and switches fitted. - Also main lead and plug provided. - Two holes with rings and sieves for insertion of arms provided. M.S. structure with slopping front, acrylic front and side doors (fully visible, transparent), 3' germicidal ultra-violet tube and 2' fluorescent tubes for white light, with necessary choke blast, starter and switches. Also mains lead; plug and two holes with rings and sleeves for insertion of arms are provided. Size 95 x 50 x 50 cms. Size 95x50x50 cms with sloping front. Acrylic sheet front and side doors (full visible Transparent) 3' germicidal ultraviolet tube and 2' fluorescent tube for white light with necessary choke blast, starter and switches fitted. Also main lead and plug provided. Two holes with rings and sieves for insertion of arms provided. Size 95 x 50 x 50 cms. 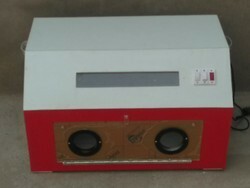 M. S. structure with slopping front, acrylic front and side doors (fully visible, transparent), 3’ germicidial ultra – violet tube and 2’ fluorescent tube for white light, with necessary choke blast, starter and switches. Also mains lead, plug and two holes with rings and sleeves for insertion of arms per provided. Size 95 x 50 x 50 cms. M.S. structure with slopping front, acrylic front and side doors (fully visible, transparent), 3' germicidal ultra-violet tube and 2' fluorescent tubes for white light, with necessary choke blast, starter and switches. Also mains lead; plug and two holes with rings and sleeves for insertion of arms are provided. ( b) -do- fitted with small tube.